Millets or Nutri Cereals are known to be the most important crops which are drought resistant. They are largely grown in Africa and Asia as they have the semi-arid regions. It is known to be a major source of proteins and carbohydrates for the people dwelling in these areas. The millet grain is known to have potential health benefits and hence, it has started to gain importance from the nutritionists and food scientists. The processing technologies were first used to improve the nutritional characteristics of the grain. But with time, it did meet with limitations and challenges for promoting utilization of millets. The aim of these processes aims at increasing the physicochemical accessibility of all micronutrients and decrease the number of anti-nutrients like phytates. It also aims to increase the number of compounds which improves bioavailability. Millets are generally subjected to varied treatments for improving their edible and sensory quality before they are consumed. Millets cannot be decorticated like other cereals. When millets are exposed to hydrothermal treatment, the endosperm texture gets hardened so that decortication is enabled. The decorticated millet becomes edible and has a soft texture similar to rice within 5 minutes which was not before. Now it can also be cooked. However, the hydrothermally processed and decorticated finger millets show significant changes in its nutritional contents. The fat and protein content of millets are not found to have any effects of decortication. The process significantly decreases the content of dietary and crude fiber, phenols, minerals, and antioxidants. The reduction of these nutrients is caused due to their peripheral location in grains. But, decortication is usually done to improve the edible properties of millets. Non-motorized grain mill usually mills the millet grains that are cranked either by hand or by any other non-electric method, especially in the households of the rural areas. At times, manual grain mills attached to an electric motor are also used. The milling of pearl millets shows a change in the chemical composition of millets. Milling and exposure to heat lower the polyphenols and phytic acid and also improves the protein and starch digestibility. Steaming of millets at an elevated temperature and pressure increases the yield. 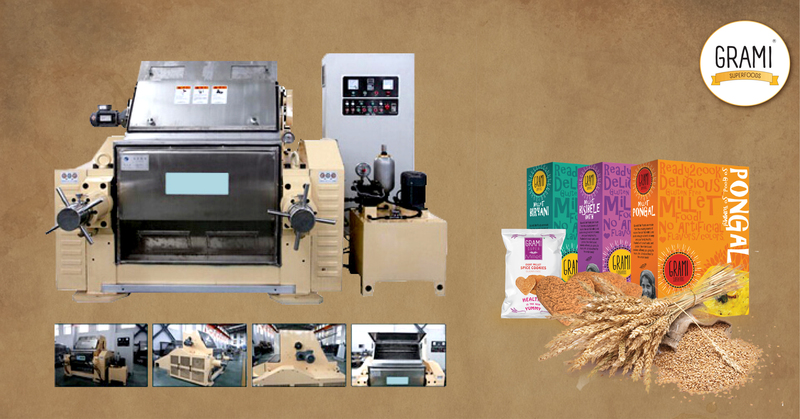 The protein, fat and fiber contents are known to decrease with the increase in milling time and moisture. With the sieving procedure, the bran of the millets get removed which are known to be rich in nutrients like fiber, antioxidants, and minerals and this leads to the decrease in nutritional value of the grains. Future research should provide optimized milling conditions that would provide a high yield of the grain with quality nutrient composition. The germination increases the total content of sugar and free amino acids and decreases the starch content. Tryptophan, non-protein nitrogen, and lysine also increase at the same time. It also appreciably increases the protein and starch digestibility. The increase in protein digestibility reduces anti-nutrients like tannins, phytic acid, and polyphenols which interact with proteins to for forming complexes. The extractability and bioaccessibility of minerals like zinc, calcium and iron increases in finger millet and pearl millet. It causes significant improvements in the amounts of niacin, thiamine, protein factions, soluble dietary fiber, and lysine. Malting is known to improve the digestibility and nutrient content of foods. The process of malting should be applicable on an industrial scale by using novel germinators for providing products that are rich in malt. This will promote the consumption of millets on a large scale. It not only decreases the anti-nutrients but also increases the protein availability and protein digestibility along with the nutritional value. It causes partial degradation of the complex proteins. Natural fermentation of millets reduces the phytic acid, and polyphenols. For the preparation of safe millet and millet food products, this technique should be carried on a commercial scale through modern equipment for providing rich nutritive millet food on a large scale. It is a popular technique for reducing the anti-nutritional compounds like phytic acid. It also improves the bio-availability of the minerals. Soaking of pearl millets results in loss of iron, phosphorus, and calcium but increases the solubility of Zinc. Soaking of millet grains under optimized conditions reduces the millet’s anti-nutritional content for enhancing the bio-availability of nutrients of the millet food. In many of the developing countries like Africa and Asia, millet is being processed and converted for consumption in the traditional meals. Millets are known to provide the human body with the highest nourishment. This is because; it has a high content of proteins, solids, moderate pH, and acidity. The high content of Calcium in millets promotes bone strength and healthy teeth. Conversions of millet to a common millet food known as Fura, in West Africa are one of the most important sources of nutrient in the region. This food is known to be rich in flavonoid and nutrient content. Millets are known to be a good source of protein and provide high energy. It is also to be kept in mind that it is extremely essential to provide innovative technologies for processing and converting millets into liquid food drinks that are not only safe but are also rich in nutritional content. This can then only be consumed by a large population in both rural and urban areas.